So you’ve decided to get rid of unwanted hair and you are choosing the best epilator for this? Well, the most important is to take your time, since it’s not the case when you have to hurry. What is special about all epilators – Is that no matter which one you buy you’ll need some time to get used to the discomfort during epilation. Women who have ever bought an epilator are of two types: the first one – they have used it once and thrown it away and the second type – they’ve got used to it and now they don’t feel any discomfort while using the epilator and enjoy their perfectly smooth skin. 1 Wow, let’s find out what actually an epilator is? 3 OK – then what epilator to choose? 4 Can we use an epilator in the bath or shower? Wow, let’s find out what actually an epilator is? This is a device for unwanted hair removal from the root, this way the hair follicle is being destroyed at the same time. So in general all epilators have one and the same task – remove the hair from the root. 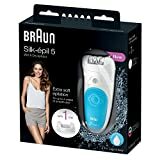 Braun Silk epil 9-579 WD – is a superior quality epilator. It’s even more than epilator, since a facial cleaning brush is included in its set. And it is rather efficient by the way. Emjoi AP-18 – this one is good for the first try. In case if you are not sure whether you are going to like it or not. This is a classical epilator, moderately priced and without any additional functions. 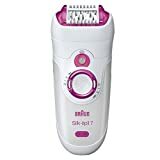 If you are confused which epilator is the best as for the number of operating speeds and caps, then without any doubt you should choose Braun Silk epil 9-579 WD. Since it is not just an ordinary epilator, at the same time it is a device for skin cleaning with 6 caps and 2 operating speeds. The epilator head is 40% wider then the previous models had, that’s why it covers the lager body area and removes more hair in one move. Due to this Silk-epil 9 Skin Spa lets you spend much less time on epilation, than you did before. Special technology Microgrip has turned this epilator model into a real beauty product. Actually, this device is like improved tweezers that remove hair softly and painlessly. All above mentioned ensures removing even the smallest and shortest hairs (up to 0.5 mm long). As I’ve said above this model has 2 operating speeds. If you are using the epilator for some delicate body area (facial epilation, for example) or this is the first time you are removing the hair from this body part, the manufacturer recommends choosing the 1st speed. However, if you are using a shaving head, it’s better to do it on the 2nd speed. There is no discomfort during the process, but this way it goes faster and better. A facial massager brush comes in a set as a very pleasant bonus, which makes Silk-epil 9 Skin Spa more than just a usual epilator and it becomes a mini-system for body and face care. The brush ensures make-up removal and deep cleansing of face pores which is 6 times more efficient than common mechanical cleaning of the face. All of these help skin to absorb different moisturizing creams better and makes it clean, fresh and shiny for a long time. Wet&Dry system allows using the epilator without being afraid of any water around – you can use it even lying in a bath or when having a shower, as well as applying different gels, shaving foams at the same time. You can also wash the epilator head with water. For many users it appears to be important. This epilator model is both mains operated and rechargeable. The epilator head has 40 tweezers and this ensures your skin staying smooth and soft up to 4 weeks. If you have some discomfort at first don't consider it a useless thing and waste of money – you are going to love it! It's performance is a bit lower than that of the previous one, but it'll be a good choice for those who buy such a device for the first time, since it is quite nice and the discomfort while epilation is rather bearable. Braun 7 – a cordless epilator with a pivoting head is one of 2016 bestsellers on the market. It is designed for dry and wet epilation. It's a waterproof device that can be used in the bath and in the shower, you don't care where the socket is which is very convenient as well. Its 40 tweezers together with Close-Grip Braun technology ensure excellent operating characteristics and the most thorough epilation you can get. The epilator also has an cap for an electric shaver that does its job perfectly. There are 5 different caps in the set. The epilator offline operation duration is 40 minutes. Without charging the battery it is enough for 3 epilation sessions. It takes 1 hour to completely charge the battery. The epilator has 2 operation speeds. If the battery is low the indicator starts blinking with red and it turns off a minute later. When the battery is recharging the indicator is green and it stays green after the battery is full, thus you can see that the device is ready to use. This is crazy – you can use it even in the dark! Since the epilator has a built in light, so you'll see better the area of epilation.There is a shaver head and a massager to reduce pain during epilation as well as a precision cap in the epilator set. Besides a brush cleaner and cooling wet wipes are also included. This epilator model is very successful and easy-to-use as well as according to its users opinion it is painless with repeated use. It lets your legs stay skin stay smooth up to 3 weeks – no ingrown hairs and bumps and no red spots after epilation. The device removes hair very gently and even if some redness appears, it is gone the very next day. The epilator pivoting head easily follows all your body lines. To get the ideal result just make several moves with the epilator along the chosen body area. As we've already said it's a perfect choice for those who have just started to use these devices. It can be cleaned rather easily. You can do it with a special brush that comes in the set and then wash the epilator. If you have never used an epilator before and you doubt whether it is worth buying, so this is an ideal epilator model for you. This epilator has high performance and what is the most important – it is not an expensive one. Sadly, this model has been taken out of production, but you may still buy some on Amazon.com. So hurry up, if you need a simple and reliable epilator. Once again, it is easy to use: it has just 2 operation speeds (one is bit slower that another) and a special cap to keep the epilator at a proper angle. The “switch on” button is on the epilator case front side and you can also use it to choose one of the operation speeds. It’s better to do epilation using 2nd faster speed and then remove the hair that is left on the 1st operation speed. The epilator head has just 20 metal tweezers. The back side of the epilator case has no pictures on it, the surface is a bit ribbed to avoid epilator slipping from a hand. Since it is one of the cheapest epilator models, it is only mains operated. This epilator is perfect for those who have sensitive skin, but they still want to get excellent epilation effect. When choosing an epilator you should definitely consider Philips HP 6577. It's just a ordinary epilator in appearance, but it has some additional conveniences such as massage effect, smartlight and possibility to use it in the shower. It perfectly fits your hand and makes the skin softer and smother without any irritation. And its main feature – ceramic tweezers – they don't cut the hair they just pull it away. Due to ceramic disks with patterned surface the epilator catches the smallest and thinnest hair. It's very important that the tweezers won't cut the hair as it quite often happens when using epilator models with metal tweezers. At high speed of the epilator head rotation the hair isn't pulled away it's just being cut up and therefore they start to be a problem again very shortly. Philips HP6574/50 epilator won't cause such a trouble since it has rounded ceramic tweezers. Those can appreciate convenience, who have suffered discomfort during epilation. When using this epilator you'll feel just some light tingling. The tweezers disks are covered with silver ions which are hypoallergic that's why there is no skin irritation after epilation. The epilator can operate offline for quite long period of time. What can be considered a minus is that it has a battery indicator and when the battery is low it starts blinking with red. However, you may have already finished epilating your legs and the indicator may continue blinking till it turns off when the battery gets discharged completely, which is very annoying. The epilator case has a built in light, which is very convenient, however, it won't substitute proper light, but it helps to see tiny hair that you may have missed. As for the this illmination itself, it's not that good than that of Braun epilators, but still it's nice to have it. Massage brush is included into the epilator set. Its main task is to help you with epilation. It lifts up all hair that is close to the skin and this helps to avoid the issue with ingrown hairs and bumps. The epilator battery charges completely in 1 hour and this is enough for 40 minutes of continuous operation. Therefore, it's not necessary to look for a socket or new batteries. This model is for those who like it fast, maybe not an ideal epilation, but it's done in the shortest possible time. The device is time-proved and approved by lots of American women - it has been on the market for quite a long time. A patented technology of tweezers design is used. They consist of three movable disks (which open and close) and one disk stays fixed, not of just two ones that other epilators tweezers have. And this is the point – due to such triple tweezers the skin is slightly risen and only after that the hair is removed. The epilator head has 72 such tweezers which are arranged checkerwise. It has double head that is wide enough and with one pass it covers a quite large skin area. At that it catches all the hair perfectly, so there's no need for the second pass. As a plus it features special “lifting fingers” that lift the shortest and tiniest hairs, when even waxing can’t deal with them. Another advantage is that Silver Ion Technology is used here – it ensures antibacterial properties. The manufacturer assures that this epilator can be used not only for legs, but for underarms/bikini zones (since the skin is more sensitive here, you'll have to get used to it) and even for a facial epilation as well (it's really so). Actually it's not an epilator, it's a trimer. But still women need them both, because it's not very convenient to use an epilator for facial epilation . Panasonic ES2113 trimmer has a cap and a brush to clean the device in a set. The cap is made of some sparkling plastic, which makes the epilator not just a useful device, but a stylish accessory in woman’s washbag as well. It is ergonomically designed, easy-to-use and handle, its dark head is flexible and a bit pivoting. It trims well, though the skin isn't that soft as it can be after epilation. Just like the majority of other trimmers the device has 2 plates with teeth and they move hast close to each other. The teeth have smooth edges, they don't scratch skin. The device needs cleaning once a month – just clean it with its brush and aerate it. One AAA battery is used as a power supply and it lasts for long. If the battery starts getting low the device starts working slower, so this is the time to get a new battery for it. The noise is quite bearable, not loud. It's convenient to take it with you on a trip. The device helps any woman be a princess and forget about all these ingrown hairs and bumps as well as waxing horrors! This option is an excellent one for those with coarse and dark hair. Quite often it's not that easy to remove it completely while a photoepilator sufficiently decreases the hair amount and its growth rate in time. So, what do you expect from a photoepilator? Right, it has to be efficient! Photoepilators with light pulse intensity from 7-8 J/cm2 and the wavelength about 650-1000 nm are considered to be the most efficient ones. These are the characteristics Remington photoepilators have. An important thing you should keep in mind is that before using a photoepilator you should remove all the hair from the area where you plan to use it with a razor or depilatory cream. It is strongly forbidden to remove hair from roots (by waxing or sugaring) between your photoepilation sessions. It is important to keep the hair roots undamaged. Using razor is also not recommended. In the first case – you perform photoepilation without any hair roots (they were pulled out when waxing) and it is meaningless, in the second case – when shaving you stimulate the hair growth and we want directly the opposite. What you can do to improve the photoepilation process is to let the hair grow a bit for a day or two to make it more visible and let small hairs show. Using photoepilator has turned up to be a piece of cake: you plug it in, push the power switcher, then you put your wrist (for example) to a special sensor the device has to let it define the skin tone and choose the proper operation power – this way it is activated. Then you just “take photos” where it is required by applying the photoepilator to the skin and pushing the special button. The flash light power can be adjusted manually thus you can ignore the device settings, since it usually chooses the less powerful mode. As for how it feels – the photoepilator flash is like touching a hot light bulb, but only hair follicle get burnt, not the skin. When you set a high power of the flash and use the epilator on some sensitive areas sometimes it is hardly bearable – the first time of using photoepilator is the most painful one (a lot of hair and lots of microscopic thermal wounds), next time the procedure becomes less and less painful. You can perform photoepilation not more than 2 times a week till you get a desirable effect. Please, keep in mind that the hair starts to fall not at once, but from the second week of performing epilation or even later! If you didn't shave the hair completely then after the flash you may smell some burnt hair. So, better don't do this since it doesn't make the process more efficient. After the procedure there may be some redness on the skin, but it'll pass in about 20 minutes. It's not recommend to take a bath or shower for 24 hours after photoepilation as well as to use any cosmetic products on the treated skin area. After the first several photoepilation procedures the result is not very visible, the unwanted hair continues growing almost the same. The initial time interval between the procedures is 2 weeks, i.e. the manufacturer recommends performing photoepilation once in 2 weeks. In 1.5-2 month you’ll see the first results – the hair starts growing slower and it becomes thinner. Each time the interval between the procedures increases. However, you shouldn't expect any result to last forever – you see the effect while you keep using the device. If you make a break for several month the hair starts growing almost the same as before, though it becomes thicker and darker. So, again it's not a panacea. The photoepilator cartridge is designed for 1500 flashes. You can buy and replace it yourself if necessary. The device is efficient within sensible bounds, it allows performing photoepilation yourself on some small skin areas without going to a beauty shop. 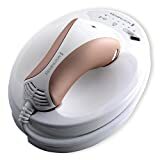 There is Remington iLIGHT Pro Plus Quartz Hair Removal System which is designed to perform photoepilation on larger skin areas, its cartridge is for 30 000 flashes. The epilator has 5 caps in its set, which makes it a rather flexible device. It has a cap for sensitive areas epilation, for highly efficient epilation, for underarms and bikini zones and a completely unique attachment for foot polishing. The latter lets you clean your feet without using a holystone or any other materials at hand. Besides the result is much better as well. Wet epilation is also possible with this device. Yes, it can operate from a battery and you can take it to the bathroom and use it there. The advantages of wet epilation are obvious. The main one is that skin irritation is much less and it passes faster if compared to dry epilation. Due to soapsuds the epilation passes softer and the epilator moves smoother. But here we are talking about epilation with some shower gel (it is applied on the epilator head), not just about the epilation in the water or when the skin is wet. The idea of cordless epilation is also very convenient. Since you don't have to be stuck to a socket and be surrounded with wires. The battery charges completely during a hour and this is enough for 30 minutes of continuous operation, as the manufacturer states. I personally haven't checked if it's true, but as far as I can see it looks like this. Illumination is a useful thing, however, I wouldn't say that it is a crucial point, it's more like a nice bonus the device has. Simply because it won't substitute daylight or some other proper lighting. As for the epilation efficiency…well..there are some issues. Panasonic misses quite a lot of spots and you have to go around one area several times. It doesn’t catch any short hair (though the manufacturer states that this epilator will remove even 0.5 mm short hair). The result after the 1st epilation or after a long break without epilation lasts for about a week and after further epilations some hairs start growing in 2 or 3 days after the procedure. As for the sensation of pain - Panasonic is almost the same as Braun, i.e. it hurts in the beginning and after several further procedures the skin gets used to it. But still Panasonic epilator removes hair more gently. The main difference between Panasonic and Braun is the design of the epilator head. In case of Braun epilators – it is one cylinder with tweezers, but Panasonic epilator has two closely placed cylinders of smaller diameter. Each of them has 24 tweezers and it makes 48 tweezers total. The epilator head is a pivoting one. The main question is how convenient is this? Yes, the two cylinders have large contact area with the skin. But this works only for more or less plain body surfaces (legs and hands), but not for underarms. It's not that easy to get there with such a wide epilator head. That 's why epilation takes much more time even more than when you are using Braun with smaller number of tweezers. As a result legs epilation is faster and it's completely inconvenient to use the epilator on underarms. Be careful and read the manual attentively. For softer epilation you may use a shower gel, it is enough to apply one or two drops on the epilator head, turn it on and you'll see how it foams. And as it is mentioned in the manual don't use any bath foam or shaving gel – the epilator cap may clutter up. For those who are using the device for the first time I'd recommend wet epilation it'll be much easier for the first time. As for the attachment for feet it excellently removes coarse skin, but everything is good in moderation, so don't go overboard or you'll get large corns later instead. So better use the epilator for some thin layer of coarse skin and use the holystone for the rest. As for the comfort we should mention two components. First of all the epilator is convenient to hold – its oblong shape allows it to fit the hand perfectly, so it won't slip out even during wet epilation. We should mention that the device has just two operation speeds. For demanding girls it may be a drawback, but on the other hand it is compensated by the fact that this model is a multipurpose one and it has 5 operation modes. That's why the epilator can easily deal with any task and 2 operation speeds are quite enough for this. 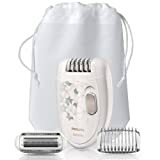 If you are looking for a budget choice epilator without any unnecessary caps, you may enjoy this model particularly because its manufacturer is reliable and well-known. The epilator perfectly deals with its task at hand. It can be taken to the shower and used with a shower gel, it catches hair 0.5 mm short. The epilator head can be detached and washed. This epilator model was designed to lessen the pain during epilation. The goal was achieved mainly due to the possibility of wet epilation. Special design of the epilator head also helps with this task. It consists of 28 tweezers of two types – plastic and metal ones. It's an excellent stuff for the money! Silk-epil - from the world's number 1 best selling epilator. Sometimes women due to some inborn or adult-onset endocrine profile changes get rather serious cosmetic issue – unwanted hair on a face. Even if the hair amount is rather small, it doesn't look good and surely it may affect women's self-esteem and her self-assertion. 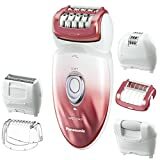 Remington EP7030 epilator is an ideal choice to remove unwanted facial hair on lips, chin and cheek-bones. That's why it was wet epilation model to be chosen for this purpose, because lubricants lessen the process painfulness which may be rather bad around nasal septum. The 1st operating speed is recommend to be used for facial epilation to obtain the best results. 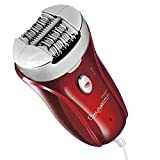 Remington EP7030 as any other epilator of this product family has a pivoting head and 2 operational speeds. Epilator is also designed for dry and wet cordless epilation. It has two replaceable heads and the roller massages your skin as well. There are 40 tweezers which throughly remove hair, illumination is also present which helps to see the missed spots. Surely, the device is washable and cordless. Wash the epilator with running water after use. Clean the roller and the blade with a special brush, but don't use it for the grid! The battery level is indicated with 2 LEDs – green and red one. If the warning light is on, then it's time to charge the battery of your Remington EP7030 epilator. After using this epilator the skin has no significant damages, irritations or redness and this is crazy! The obtained effect lasts for about 3-5 weeks! 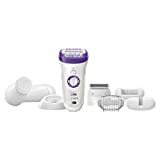 Contrasted with all its advantages and benefits against other epilator manufacturers, this epilator price seems rather reasonable and feasible and it completely corresponds to the offered product quality and features for this price. First, remember – you'll get the skill for perfect and fast epilation not the very first time you've taken the epilator in your hands. Any epilator manual quite often isn't the best advisor in this not easy task – how to do your first epilation. It'd be good if you find some video tutorial explaining how to do epilation painlessly. You'll be able to do epilation professionally at least by the 10th time of using the device, after learning your most painful spots and choosing the proper operation speed. 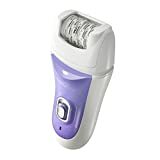 If before buying the epilator you were using a razor and you've got used to shave your legs, then you'll have to let the hair grow for 1-2 days and then do your first epilation. To catch the hair the epilator needs to capture it in full, which is difficult if the hair is too short. During your first epilation use the 1st slow speed. The fast one reduces the epilation time, but the tweezers can capture only some tiny hairs. Especially if you used to shave your legs before using the epilator, the hair becomes coarse and it can be taken from the root only at low speed. To reduce the discomfort use a massage cap over the epilator head. Make it a rule to epilate yourself after a hot bath or at least after a shower. If you have a habit of shaving your legs while taking a shower, then now removing the unwanted hair will be done after it. Staying in hot water causes skin pore enlargement and this will make using the epilator much easier (than if the skin is dry) – the hair is removed painlessly from the root with epilator tweezers. Epilation should be done against the hair growth, otherwise you'll have to go around one and the same spot several times trying to get hair out, which isn't very pleasant. Even if you've got used to shaving your legs by moving the razor in any direction, still try to get accustomed to using the epilator properly from the first time. Don't press epilator to the skin too hard, it won't function better because of this, but you'll get irritated skin instead. Move the epilator maximally smoothly over the chosen zone, as you've done it with the razor, without any push. Hold the epilator a bit inclined to catch each hair along the way. The most sensitive skin zones are ankles and skin behind the knee. The rest of the skin surface quite fast gets used to the discomfort and in 305 minutes since you've started the epilation it's not that painful as it was in the beginning. Due to the smooth surface of legs skin it's easy to remove the unwanted hair here. Underarms skin is more sensitive and delicate – this means that it requires a special care. So to avoid pinching the skin with epilator tweezers you should pull taut the skin folds a bit while moving the epilator there. This way there'll be no missing spots. Too long hair underarms may be rather painful and uncomfortable to remove, therefore make it shorter before the epilation (but don't shave it completely). However, one of the most sensitive skin surfaces is a bikini zone. It's advisable to perform epilation there using some cooling gel or etc. OK – then what epilator to choose? In general all epilators can be divided into two types according to their design: they are using rotating disks or tweezers. Both types remove the unwanted hair mechanically, but there are also photoepilators. However, if you’d like to install the camera on your head or just to film handheld for a long time you’ll feel the difference in camera weight even if it is several grams. However, it’s not worth chasing neither small sizes nor light weight of a camera. The drawback of a camera small size starts from absence of display and ends with the battery size and as a result it affects the camera operation time. Epilators with tweezers are the most popular and moderately priced epilators for personal use on the market. These are of two kinds: with metal or ceramic tweezers. Epilators with metal tweezers are cheaper and less demanding in maintenance, but they aren't good for those with sensitive skin. 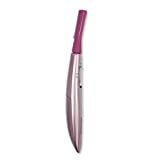 As for the epilators with ceramic tweezers – they are exactly for people with sensitive skin, but they cost more and they may be damaged if you accidentally drop the epilator on the floor (for example). Epilators with tweezers have plates (tweezers) that pinch the hair from roots when the epilator operates. Rotating disk epilators remove not more than 32 hairs at a time, but those with tweezers – up to 48 hairs and this number depends on how many tweezers the epilator head has. Of course, if you use an epilator with 48 tweezers at high operation speed it'll be painful, but fast epilation. In case if epilator head has 12 tweezers it'll be less painful, though the epilation itself will take sufficiently longer. So, if you decide to buy tweezers epilator the optimal number of tweezers is 32. As for the rotating disk epilators – they have several pairs of disks that rotate and approach close to each other this way pulling the hair out at the roots. they perfectly deal with hair removal in bikini zone. As a rule both disks and tweezers are made of metal, but there are some epilator models that have ceramic ones. Such epilators are much more expensive and it'll be a good choice for women with sensitive skin that becomes irritated after using epilator with metal tweezers. As the time goes by the discomfort during epilation lessens, since the hair becomes thinner and it becomes easier to pull it out. Manufacturers equip some epilator models with pain relief stuff. You can judge from the epilator name if such thing is present. Thus, Philips epilators will have a prefix – Satinelle Sensitive in their names, and Braun devices will have Silk-epil prefix, correspondingly. Modern epilators as a rule have 2 operation speeds, but there are some models with one operation speed. I'd recommend to give preference to the models with more than one operation mode, especially if you are a newbie in all this stuff. At first you'll be using the epilator 1st operation mode to get used to the process and get the idea of how to epilate yourself properly. This first operation mode is also good to remove coarse and thick hair. More experienced users can start using the second operation speed: the epilation process will be faster in this case. This mode is also good to remove long hairs as well. Before you decide which one to choose, think how and where you will be using your epilator more often . If you tend to do epilation at home it is usually advised to buy a mains operated device. However, for those who travel a lot it'd be better to use a cordless epilator, since in this case you don't depend on a socket presence around or its location. Though you'll have to remember to charge the battery regularly. Sufficient advantage of cordless epilators is that they can be used for wet epilation in the bath or in the shower. Can we use an epilator in the bath or shower? Water helps to lessen the pain during epilation. That's why it is recommend to perform epilation in the bathroom. But this is possible only if the device can be used for wet epilation. For example, Braun Silk-epil epilator is waterproof as well as some Rowenta and Panasonic epilator models. The presence of «wet and dry» sign means that the device is a waterproof one. Epilation process usually gives your skin some micro-irritations, that's why you should keep your epilator clean. It's better to buy a device with a removable head: you can wash and disinfect it after epilation is over. It'd be more difficult to maintain the device with an embedded head, which you can't remove. Make sure that the epilator set includes a cap and a cleaning brush for epilator head. Use them to keep your epilator clean. Quite often the built-in light is presented as an additional feature. It illuminates the area that is being epilated so you won't miss any hairs there. This function is also helpful if you are epilating yourself and there is lack of light. However, you can easily do without this feature. these are usually for bikini and underarms epilation. These caps cover some section on rolling disks or tweezers on the epilator head and limits the skin area that is being processed. This way epilation of sensitive skin zones becomes more comfortable and less painful for the first time. You may use these caps also while getting used to epilation discomfort, since when the number of simultaneous tweezers pinches lessens, the pain decreases as well. Trimmer. You'll need it not to pull the hair from roots, but to cut it. It may be applied while taking care of the bikini zone when making some intimate haircuts for peeling. Such haircuts can be done when there's the issue of ingrown hairs and epilation isn't the best way to get rid of unwanted hair in this zone. By means of this cap the upper skin layer is exfoliated and the ingrown hair is released.